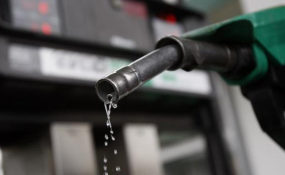 The Nigerian National Petroleum Corporation (NNPC) is worried about the proliferation of fuel stations in communities at the nation's borders which has led to an unprecedented smuggling of petrol to neighboring countries. This has made it difficult to sanitise the supply and distribution matrix in the country. The Group Managing Director of the NNPC, Dr. Maikanti Baru, said based on the heightened petrol consumption rate of 50 million litre per day, the corporation was incurring an under-recovery of N774 million daily. Under-recovery is the difference between the landing cost and the cost at the pump station. Baru explained that because of the obvious differential in petrol price between Nigeria and the neighbouring countries, it had become lucrative for the smugglers to use the frontier stations for smuggling of products across the border. This has resulted in a thriving market for Nigerian petrol in Niger Republic, Benin Republic, Cameroun, Chad and Togo and even Ghana which has no direct borders with Nigeria. Consequently, Baru said: "NNPC is concerned that continued cross-border smuggling of petrol will deny Nigerians the benefit of the Federal Government's benevolence of keeping a fix retail price of N145 per litre despite the increase in PMS open market price above N171 per litre. "Baru, who spoke in Abuja when he paid a courtesy visit to the Comptroller General of Nigeria Customs Service, Hammed Ali, hinted that the proliferation has driven up national consumption figure from 35 million litres to above 60 million litres per day. The NNPC boss said a study conducted by the corporation revealed a strong correlation between the presence of the frontier stations and the activities of fuel smugglers.According to him, the smuggling has led to an abnormal surge in the evacuation of petrol from less than 35 million litres per day to more than 60 million litres per day. The study revealed that 16 states, having 61 local government areas at the border communities, account for 2,201 registered fuel stations. The fuel tank has a combined capacity of 144, 998, 700 litres of petrol. Also, eight states with coastal border communities spread across 24 local government areas account for 866 registered fuel outlets, with combined petrol tank capacity of 73, 443, 086 litres. A further breakdown of the findings shows that among the states with land borders, three local government areas in Ogun State account for 633 fuel stations with combined petrol tankage of 40, 485,000 litres while nine local councils in Borno State have 337 fuel outlets with combined petrol storage capacity of 21, 114, 480 litres. Lagos State with one local government at the border community has 235 registered fuel stations with total petrol storage facility of 19,916, 600 litres. On the coastal front, Lagos with six local government areas leads with 487 registered fuel stations with combined in-built storage capacity of 50, 239,560 litres, Akwa Ibom with five councils has 134 registered retail outlets with capacity to store 8, 322, 986 litres, while Ondo State with two councils has 110 fuel stations with capacity to store 3,871,320 litres.Ali said the Customs Service would work with the corporation to tackle the smuggling of petroleum products. Meanwhile, the Nigeria Labour Congress (NLC) has vowed to continue to oppose the full deregulation of the oil sector until three existing refineries are producing at the maximum capacity and new ones are built. Reacting to the NNPC findings, Deputy President of the NLC, Peters Adeyemi, accused the government of laziness and always raising petrol price when it needs cheap money to fund projects. "But for the interventions of the NLC in the last 40 years, the price of petrol would have been more than N500 per litre today. Successive governments have been very lazy in devising means of generating resources to fund their projects whenever revenue dwindles. To government, deregulation means price increment only. They are not willing to explore critical areas of operation that can improve efficiency and reduce corruption prevailing in the system even under this current government. We have said that we will only accept deregulation when the existing refineries are working and new ones are built. Deregulation based on importation will lead to increase in prices and not necessarily improve efficiency of the sector," the labour leader said. Besides, the Petroleum and Natural Gas Senior Staff Association of Nigeria (PENGASSAN) has urged the Federal Government to pay the NNPC all the expenses it incurred on subsidy payment to marketers. Rising from its National Executive Council (NEC) meeting in Warri, Delta State at the weekend, PENGASSAN said NNPC had continued to shoulder the responsibility of providing products to close gaps created by the withdrawal of other marketers owing to the non-payment of subsidy claims from 2015 to 2017. In a statement which was made available yesterday by the PENGASSAN President, Francis Olabode Johnson and the General Secretary, Lumumba Okugbawa, the union stated that the extra burden absorbed by NNPC was depleting the corporation's finances and consequently hampering an effective discharge of its statutory obligations. The oil workers expressed worry over the delayed payment of subsidy and debts owed oil marketers and urged the Federal Government to resolve the differences to avert the loss of jobs in the oil and gas industry.